The camera lighting made this big teardrop-cut Moss Agate cabochon appear more gold than it is; the cab looks redder in person. There is a small vug at lower right, not visible in the photo. 49.5mm x 32.5mm x 7.5mm. Weight: 89.40 carats. 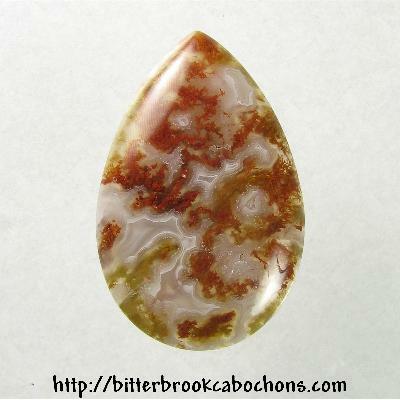 Do you like Moss Agate Cabochons? Click here to see all of the Moss Agate Cabochons on the site!